The Palestinians submitted documents to the UN to join the International Criminal Court (ICC) yesterday, a high-stakes move that will soon enable them to pursue war-crimes charges against Israel. The Palestinians moved quickly to join the court after suffering a defeat in the UN Security Council, which rejected a resolution on Tuesday that would have set a three-year deadline for the establishment of a Palestinian state on lands occupied by Israel. Handing over the paperwork is the last formal step for Palestine to become a member of the world's permanent war crimes tribunal. 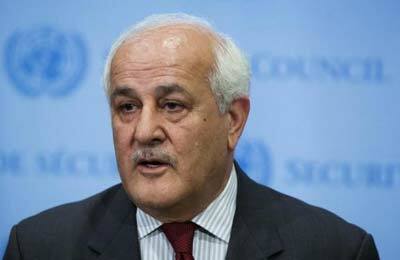 'This is a very significant step,' Palestinian Ambassador Riyad Mansour said after delivering the documents to the UN assistant secretary-general for legal affairs. Israel has threatened retaliation if the Palestinians join the court, and the US has also vehemently opposed the move as an obstacle to hopes of reaching an Israeli-Palestinians peace deal. Palestinian President Mahmoud Abbas, under heavy pressure to take stronger action against Israel after a 50-day war between the Jewish state and militants in Gaza over the summer, signed the documents a day after the Security Council rejected the resolution. Mansour said the Palestinians are seeking to raise alleged crimes previously committed by Israel, including those that occurred during last summer's war in Gaza. He said the Palestinians will also be seeking justice for Israeli settlements on Palestinian territory, which he said constitute 'a war crime' under the Rome statute that established the court. The Palestinians could seek to have Israeli military or political figures prosecuted for alleged crimes involving settlement construction on occupied lands or actions by the military that cause heavy civilian casualties. He said he would be meeting with an official from the registrar's office in New York last night to discuss the issue. It became possible for the Palestinians to join the ICC after the UN General Assembly voted overwhelmingly in November 2012 to upgrade the Palestinians' status from a UN observer to a non-voting observer state. Last month, the 122 members of the Assembly of States Parties to the Rome Statute, which established the ICC, decided to allow the Palestinians to take part in their meeting at UN headquarters as an observer state.